Silky mouth feel and rich body. Deliciously smooth, light golden in colour, full bodied aromas of vanilla and banana and a lingering aftertaste. 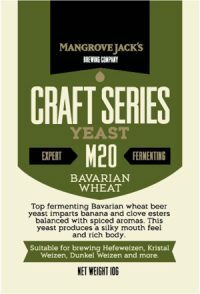 This yeast produces a silky mouth feel and rich body.Suitable for brewing Hefeweizen, Kristal Weizen, Dunkel Weizen and more. Usage Directions: Sprinkle contents directly on up to 23 L (6 US Gal) of wort.